Then what would be the point of torches? Hence making this change that much more stupid. For newbies who can't make a lantern from lack of materials. Which came first, a torch or an efficient light/lantern? Same simulation in Minecraft, I suppose. Ignore the fire. Failed experiment. Nuff said. He has already said all placed torches will be replaced by lanterns. So no. Not to mention the dangers now associated with having any torches on wood. Miss the torch, light your structure on fire. Get too close to the torch which sometimes happens and you can't hit it but strike through it.. and your structure is on fire. I'm not so worried about the change (seeing as how all my current torches will now be lanterns) but I am worried about lighting my many many wooden structures/posts/walls/floors on fire by accident when relighting new torches. I've already lost structures with the "I wanna fireplace" issue I keep putting myself through :tongue.gif:. Your face when you find lanterns can't be destroyed and replaced. all "PLACED" torches get replaced? what if i were to put a chest filled with torches? so i guess that means i should go make a ton of torches, make a big room and just place them everywhere. do they break when u hit em? r they replaceable? = Lava, flint, or torch. the bottom middle iron could also be a stick and the could be coal. thats just for one lantern, wayyyy to much resources just to get ONE lol. Right. Because lanterns are going to look and be completely stupid, despite the fact that we have no idea how they work in any way apart from that they're permenant sources of light. There is literally no other information on them, but we can tell that they're going to look stupid anyway and be annoying to place. Considering that nearly every supporter of lanterns wants them primarily for decor on their structures, because "OMG TORCHES ARE THE FUGLIES!!11"... I said lanterns in mines will look stupid, not because of how they work, but because of what they will undoubtedly look like (or be intended to look like, given graphic limitations in the game), which are fancy decor items, similar to paintings. Wouldn't a cave/mine lined with paintings look stupid and out of place? That being said, I will use lanterns regardless of how out of place and idiotic they look in mines, because I'm not going to explore a cave or mine and NOT SECURE IT. ... That's not only tactically retarded, especially if you plan on using it more than once, but I find an enjoyable aspect of the game to conquer territory, especially since I play single player, where I'm the only one there who CAN conquer it. I look at mobs as obstacles to face and overcome, not as obstacles that never end in areas. Otherwise, I have no reason to mine. I don't NEED diamonds or iron. I WANT them. But there comes a point when it's no longer fun to bother to get them. So yes, I see finite torches and the additions of lanterns to be a terrible idea, because it's tedium for the sake of aesthetics. Lanterns will serve no greater purpose than torches do currently, other than to look different and be more tedious to create. They're exactly like paintings, except the player is now punished for not having these particular paintings. It's a terrible, retarded idea, based on current player boredom with the status quo. I'm not against having lanterns in the game. I like having more household decor items. I like having more things to craft and use. I'm just against the idea of torches being nerfed and finite because of it when they shouldn't be. You can recover torches (obsidian, wood, lava, rails too), so lanterns should be the same way. 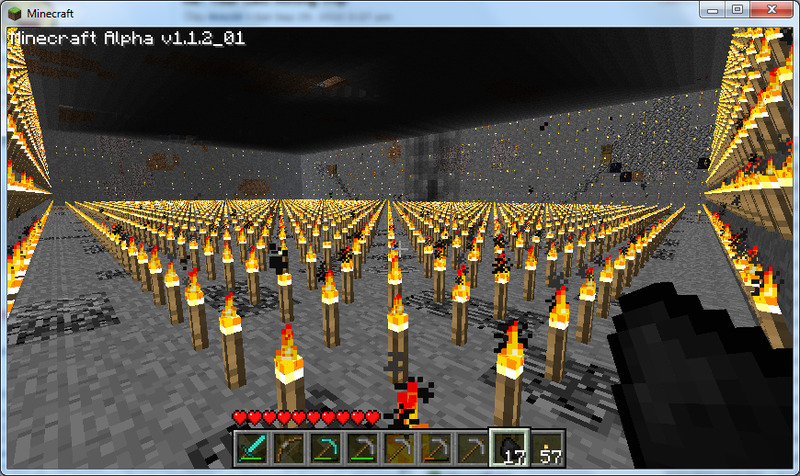 Its useless to place a massive amount of torches. They will change in your inventory as well as on your walls. All Notch is going to do is change the current torch sprite to a lantern and change the recipe. The new limited torches will use the current torch sprite with the current recipe as a new block ID. Please grandfather OLD torches. I am fine with your torch changes, but consider this. Before we had only one choice for a light source. I have 1000s of places lit with torches right now. Had I been able to make lanterns and knowing old torches would die, I would have done something about it. Right now I am in a world that will suddenly all go dark again. New torches should be timed, old torches though... either make them last forever OR convert them to lanterns. Don't make me go back and re-light my world. I also hope lanterns are far brighter then torches. If you're going to make this change, you might as well just remove torches. No one is going to use them any more. True, but they "never run out"
Also, laterns might be able to hang from roofs. You are all a bunch of babies. One thing I really liked about the game was the lack of forced realism. I don't want to have to worry about exploring an entire cave planting torches just to come back later and have to light them all over again. Ahh, creeper!! BOOM!! At least there is a replacement (lantern) I'm just hoping their not stupid expensive to make. Guess we'll see. The change is not for the sake of realism, as many of you are using as an argument, it's for the sake of the game being too easy with the current torch system. I believe it was in one of the Minecast episodes where Notch explained why he wanted to do this: As of now, you are literally invincible once you've placed a few of one of the first items you craft in the game. I expect most of the outrage comes from people that haven't thought about the new changes much. Godmode isn't fun, and the implementation of limited torches is not a needless annoyance, as you can still see where you placed the torches before and simply relight them. This way, you won't get lost in deep cave, but you may have more difficulty progressing and making your way out of one. Since the torches are still there once they burn out, you can still see where you've explored. There are also signs in the game people. Use them. Also, people will still use torches. They are cheap and you can use them in mass for exploring caves. Lanterns will require iron, and it would be difficult to make as many of them as you will need to light a cave. Lanterns will be for your base. Torches will be for things you intend to explore, not live inside. This is a great idea, why? In real-life-survival creating a light source is a HUGE deal. Once you got it you can now use the night, which was previously hindering you from doing anything, and get things done. As minecraft, in this stage, is fairly easy... this change will make it alot harder but in my opinion it's all good. Finally we have to work a little to get a good light source going. Did you seriously just play the "real life" card? In a game with exploding creepers, diamond pants, waterfalls-in-a-bucket, etc. I'm not sure why so much priority is put on making things like "real life." If you demand realism, then why are you playing a game? Go outside. See how well you do when you punch a stone wall. Since when has realism been a vital part of the formula of making a good game? Forcing realism in a game like this is dumb. I know I'd rather use torches as a cheap, emergency light source than expensive lanterns.